It’s time for Paper Chef! Owen at Tomatilla has picked this month’s ingredients AND tied in the "Eat Local" event championed by Jen at Life Begins at 30. So what are the ingredients this month? After missing last month I was bound and determined to take part this month! And when I read the list of ingredients I could not have been happier! I don’t know about you, but nearly every month when I read the list of ingredients things just jump into my head. I haven’t decided if that’s good or bad! It might be good because it means that things speak to me but it might be bad in that it means I don’t go out and do a bunch of research (and maybe learn something) each month. Well, I tend to focus on the positive, so I think it’s good that ideas jump into my head and it was no different this month. I recently visited a lavender farm to get ideas about how to use the lavender I grow in my yard. The very first time I ever had culinary lavender was several years ago at a cooking class. The main dish that night was lamb chops coated in honey then rolled in lavender and roasted to perfection! From that moment on I’ve been in love with the combination of lavender and lamb. 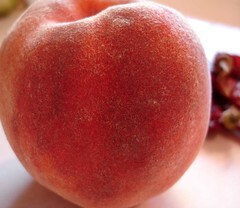 In this area, peaches are bountiful and amazingly sweet at this time of year. 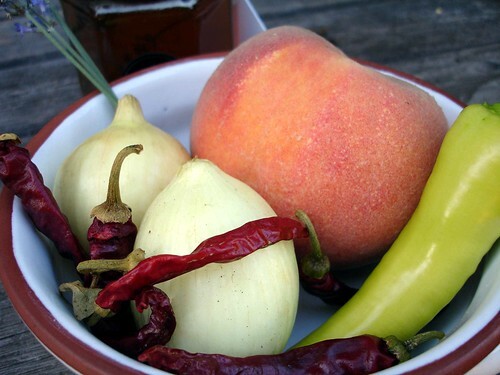 The idea of sweet peaches and heat from dried chilis immediately brought to mind a salsa of some sort. 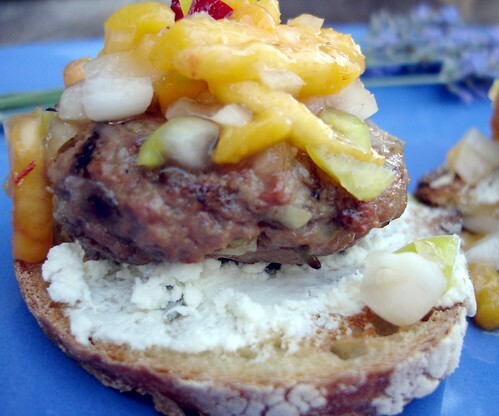 Hmm – Peach Salsa on Mini-Lamb Burgers sounds like a plan…. So here’s a list of ingredients, with a few notes but basically you should make everything (especially the salsa!) to taste. Italian Country Bread sliced thin and toasted (if loaf is large you may want to cut each piece in half): The bread is from a local bakery but the actual ingredients are most likely from a variety of sources. Fresh Chevre with Lavender: The Chevre is from a farm on Bainbridge Island and where it’s located is almost directly across the sound from my house. I live about 4 blocks from the sound and can probably see the place! As the crow flies it’s probably less than 10 miles – as the ferry goes is another story! :-) The Lavender is from my yard. Mix fresh lavender flowers into softened fresh chevre. Depending on the variety of lavender and how mature the flowers, lavender can be really strong so start slowly and add more as desired. Spread a layer of the Lavender Chevre on the toasted bread while the bread is still warm so that the cheese melts in a little. Alternatively, you could broil the cheese once it’s on the bread. The idea here is to make appetizer size burgers – like the little burgers Kerry Sears serves at Cascadia (or as a catering dish). 1/2 # ground lamb: I forgot to ask exactly where the lamb was from. I believe Eastern Washington (Ellensburg) but I’m not positive. I do know it’s US lamb but that’s all I can guarantee. Diced young onion, finely chopped garlic: Both from a Puget Sound farm – maybe 15 miles. Dash of horseradish: From the Portland area about 200 miles south. Since I’m originally from Oregon these ingredients sometimes feel more "local" than some Washington crops! And this is my favorite commercial horseradish. Chopped fresh lavender leaves: Lavender from my yard. Lavender is the only herb I can think of that the flowers are more intensely flavored than the leaves. Normally it’s the other way around. I wanted the lavender in the lamb to be just a note and not overwhelming, at all. Mix all ingredients and make six mini-burgers. Grill over charcoal (the way I did it!) or in a grill pan, just until lamb is medium-rare. Place one mini-burger on a chevre topped slice of bread. Fresh young onion diced: From a Puget Sound farm – maybe 15 miles. 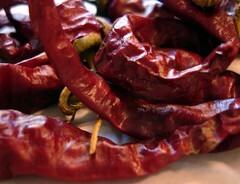 Dried Chili: I used a Cayenne Pepper that I had grown and dried at the end of last summer. Honey: I used Lavender Honey that I’d purchased from Pelindaba while I was visiting there. This is another one of those island locations -as the crow flies it’s probably less than 100 miles from here. Most of the honey I use is from Snoqualmie Valley, about 25 miles north. Mix all ingredients, adding just enough honey to lightly bind the diced fruits and vegetables. 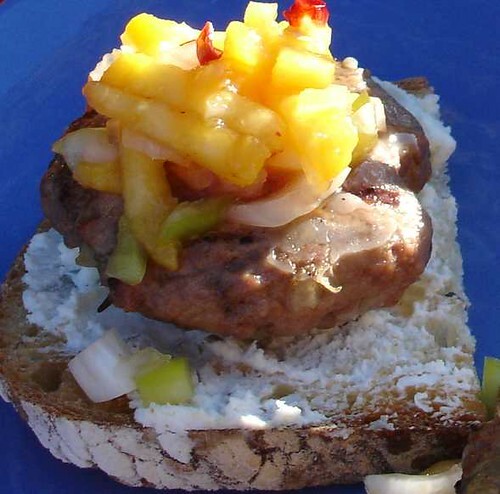 Place a heaping tablespoonful of Peach Salsa on each burger. Serve with a lovely glass of rose to help tame the fire of the chilis! My oh my! You can\’t go wrong with lamb.Thanks for taking part in this month\’s Paper Chef!